It would be difficult to imagine traveling along the Old Walkerville section of Riverside Drive without seeing the Hiram Walker main office building. Since 1894, it has remained a constant in an ever-changing landscape. The building is one of the last remaining fragments of the old Hiram Walker Empire. The cliche "if walls could talk" certainly applies to this grand old building. Hiram Walker himself worked here, as did his sons and grandsons. The building witnessed the transfer of the company from the Walker family to the Hatch syndicate in 1927 and again in 1989 when Allied Domecq purchased the company. Employees and world dignitaries walked through its doors. It was decorated for King George VI and Queen Mary when they passed through in 1939. The giant elm trees, which stood in front of the office for almost 100 years are gone. Traffic, which evolved from horse and buggy to a few automobiles, is now a steady stream of cars. The office was constructed to house the many interests of the Walker empire, including the distilling business, farming, real estate, the Lake Erie and Detroit River Railroad, the Mettawas Hotel in Kingsville and other small enterprises. For a building of this era, it had the usual features  a kitchen and dining room with a side entrance for staff, but it also boasted a barbershop and an exercise room. When the west wing was added in 1920, a swimming pool was constructed in the basement and living quarters were built on the second floor. Harry Hatch, who purchased the Company from the Walkers in 1926, was still headquartered in Toronto and on his frequent trips to the distillery, was able to use the accommodations available in the building rather than stay in hotels. The pool was available to employees and their families until about 1945 when it was closed and floored over to create much needed file space. The building is an outstanding example of Italian Renaissance architecture. The street façade was modeled after the Pandolfini Palace in Florence, Italy, and other features, external and internal, were copied from a variety of European palaces and grand houses. Contrary to conventional wisdom, the building was not designed by Albert Kahn, but by the firm of Mason & Rice, who were one of the top architects in Detroit. The designs of the internal office and some of the exterior features were, however, detailed by Albert Kahn, who was an apprentice in the Mason and Rice office. Kahn was to become one of the greats in American architecture. He continued to design buildings in the Walkerville area for many years after he completed the Walker office buildings (see issue #3 or visit our web archives). The office is constructed of a sandstone base, with Roman brick and terra cotta trim. The building has a partial steel frame, which was imported from Germany. Construction lasted two years mainly because the Ontario Terra Cotta and Brick Company, suppliers of the brick were unable to deliver their goods on time. This was no doubt difficult for the contractor, N. Reaume, who eventually, in frustration, substituted carved stone pieces in place of the terra cotta that was never shipped. The street elevation, which most of us see, boasts a pair of ornate hammered bronze gates, now black with age and a pair of lamps copied from the Strozzi Palace in Florence. The interior remains a delight, basically untouched since construction. Dark red Vermont marble steps, Numidian marble columns with capitals copied from the Zorzi Palace in Venice, marble from Egypt and yellow Mexican onyx are just some of the interior features that greet the eye. Most of the wood is oak, with individual offices finished in mahogany, walnut or gumwood. 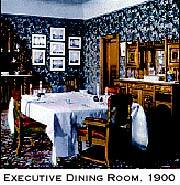 The Globe Furniture Company of Walkerville was responsible for the interior. All interior woodwork cost a grand total of $16,000. The architect made a special trip to the Chicago Worlds Fair in 1894 to purchase furniture and accessories to be used in some offices. A German who had immigrated to Detroit, Julius Melchers, did the intricate carving found throughout the interior of the building. Melchers was considered one of the best woodcarvers of his time. Before construction began, Melchers had also created a model of the building and models of some of the details that the architect had designed. The office was officially opened on September 1894 with a gala party. More than 600 guests were invited; a caterer from Chicago provided the music. Festivities went on into the night, with employees taking part after the days work was done. When the building was completed it received a considerable amount of media attention. 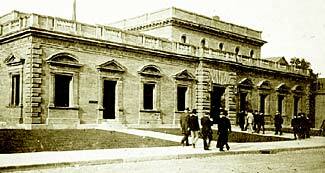 An article in the Amherstburg Echo compared the building to the Bank of England. The Empire, a Toronto newspaper, dedicated a four-page section to the office, calling it a "Commercial Palace. "The Detroit Free Press had an equally impressive write up with artists sketches of office interiors. In 1990 the building underwent an extensive $1.2  million restoration. It was washed to remove almost a century of dirt and terra cotta was brought in from England to replace pieces deteriorated with time. The Hiram Walker main office building stands not only as a monument to classical architecture but to a company that for almost 150 years has had and continues to have a positive presence in Windsor. Art Jahn is the keeper of the Hiram Walker & Sons archives.